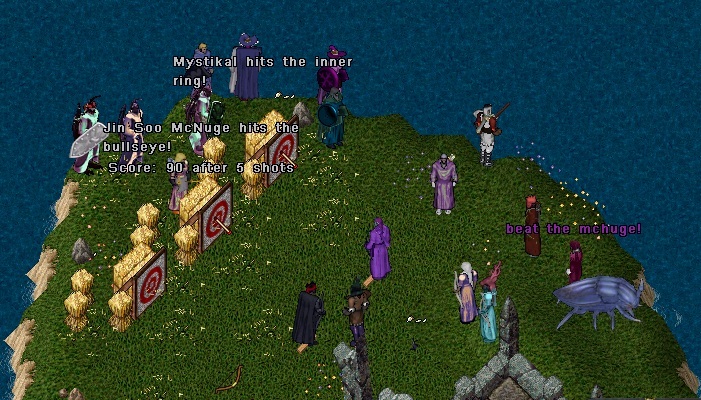 EM Avalon: Arakad you there ? Arakad Thorn: will there be any improvements or additions for the High Sea’s? customize ships, more deed areas etc? 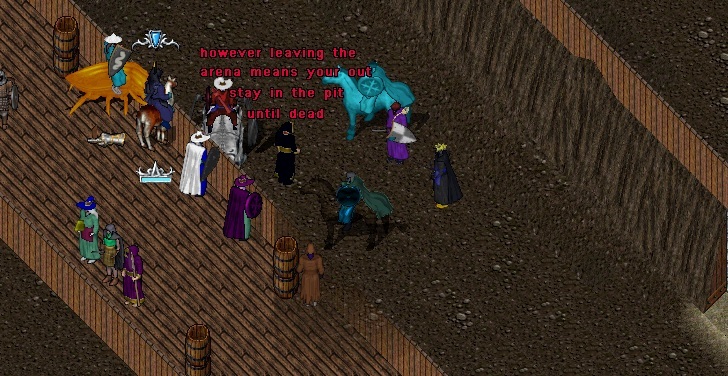 Mesanna: sorry what do you mean by deed areas? Arakad Thorn: perhaps make the cannon slots also areas to place deeded items or able to lock items down on the surface of the ship? Arakad Thorn: I don’t mean to babble a lot of questions, these have been on my mind for a while now. And appologize. Arakad Thorn: and the distillery? is there any plans to add more recipes? Arakad Thorn: ok! well then … thank you for your time! Vino Jack: Any word on if MyUO being re-worked? Kyronix : Thanks for your qeustion! Zath Stoneworker: My question is regarding the new player experience. Mesanna: The one we have not done yet? Mesanna: or the current one? 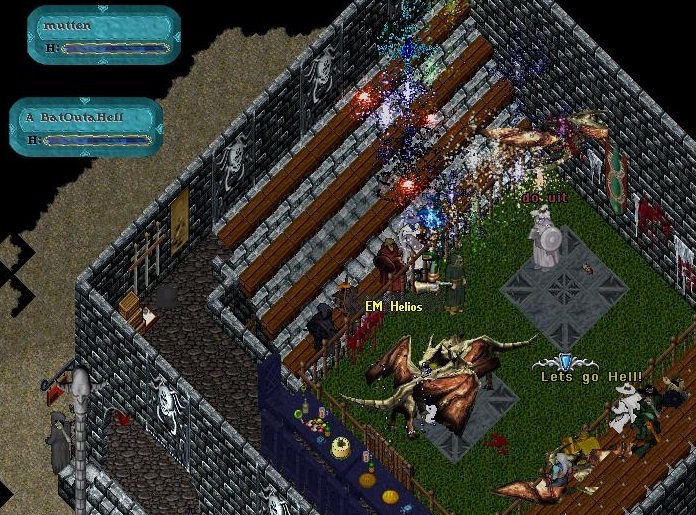 Zath Stoneworker: As it stands now, it is quite dire on people who are trying to start the game for the first time. Zath Stoneworker: They get very poor equipment, and there is no good hunting grounds to teach them the basics of the game while rewarding them. Zath Stoneworker: In a way to increase the attach rate of trial accounts. I’d like to know what is being planned to address this issue now that we will soon be at stean. 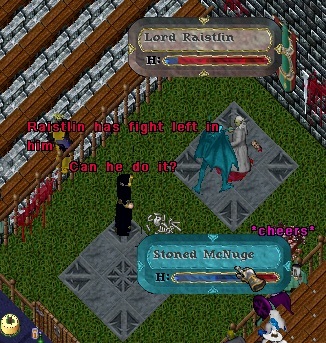 Zath Stoneworker: I understand. I also manage projects, and I know that you have time limitations. Zath Stoneworker: I’d just like to see them having to rely less on veterans to equip them so they will have a good time when trying the game again. 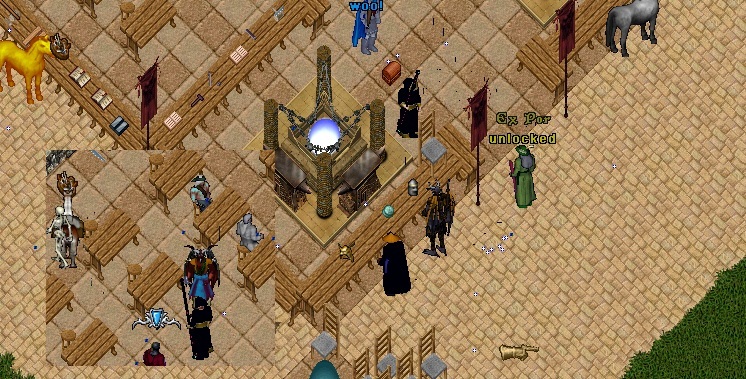 Zath Stoneworker: I am glad to hear that it will be addressed. My next and last question is about resource gathering. I am a rather new player myself, being around for only almost 3 years, and in that time I had a very hard time gathering resources. Zath Stoneworker: Ore and lumber, mostly. Mining seems to not pay the time you invest on it, and getting enough to fill BODS can prove to be a challenge. 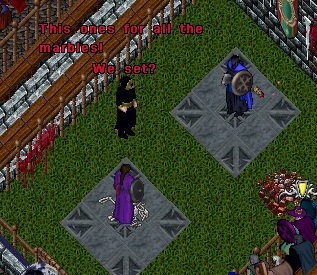 Zath Stoneworker: That will be nice indeed. Zath Stoneworker: One very last thing that came in general chat. 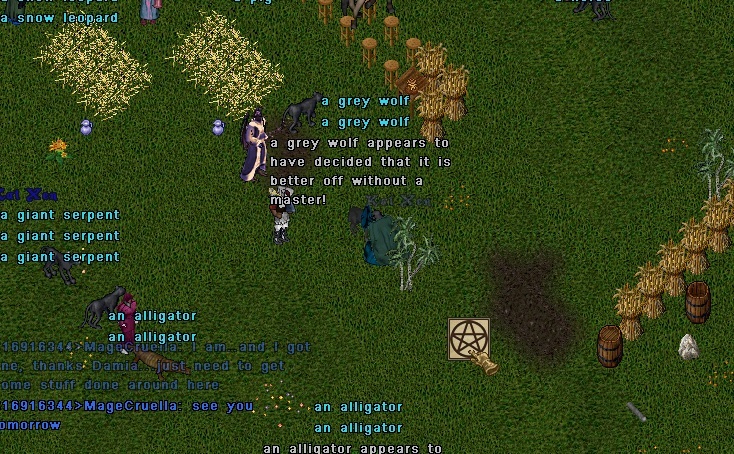 Is there a chance to see a gather all button for botanny? It takes 225 clicks to empty a 3×3 raised bed. Zath Stoneworker: A simple for loop at the gather seed and gather resource would solve that. Mesanna: Are you an engineer? Zath Stoneworker: And with this, I take my leave. Thanks for hosting this meeting. Zath Stoneworker: I have a bachelor in computer science, so, sorta. Zath Stoneworker: Nice to have you around. I will leave the spot for the next in line. Kyronix : Thank you for your question! EM Avalon: yes we do! Raven Hawk: Could you please change the default llocation changing to “nothing” after having been on a boat? Raven Hawk: Did I word that right? Kyronix : Could you be more specific? Mesanna: do you mean if you get kicked off? Misk: that should be pretty simple to fix! Kyronix : Thanks for your questions! Tika W Majere: Hi! <3 I’m so glad you came to visit! It’s really nice to see you in game form! Tika W Majere: Any plans for future fashions? Mesanna: New female clothes first!!! Tika W Majere: hehe Right on! YAY! Tika W Majere: And lastly… undie dye tub? Tika W Majere: Lastly! LASTLY! Tika W Majere: Mesanna Lanturn for Legends. Tika W Majere: Like right now? Tika W Majere: Had to ask. <3 Much love to y’all. Thank you for your hard work! lil Ray: Grettings I have several questions to ask. Mesanna: Bleak can we get those back? Sakura-X: Will Skill Cap will be araised from 120 ? Sakura-X: Is there any change of skill cap? Misk: more entries in the book? Furley’s: I was wondering how is the new Counselor program coming along? Furley’s: when do you plan on getting it going? ARAGORN: you mentioned on there about gold going away and going to a ledger system? ARAGORN: can u explain that in more detail plz? ARAGORN: can it be summarized at all? maybe concept? ARAGORN: one more question is any future plans for invasions? like the one that happened back in 2004? 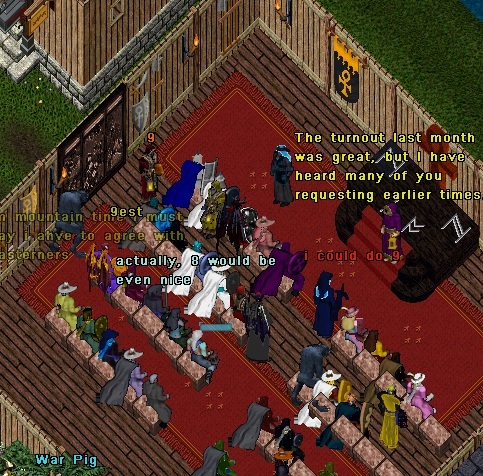 DevilsOwn: evenin all and thanks for coming to Legends! DevilsOwn: how is it going? 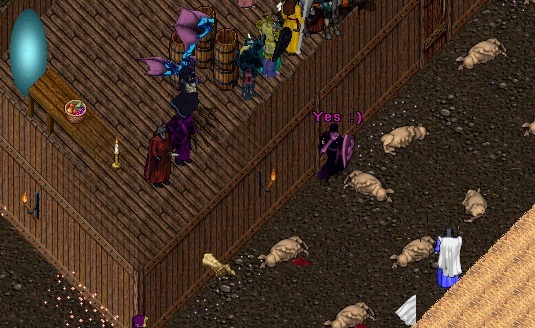 DevilsOwn: housing tiles slowing you down, yes? Kyronix : Thanks for the question! Arakad Thorn: one of them wants to know about Morph earrings, they allow humans to wear / use elf items. Any plans on including gargoyles to that list? Caelyr: would you consider broadening that to allow for user generated content? Nazoc: Why is house placement disabled on TC ? When will it be back up ? Bleak: The plan is to have it up by tomorrow. Athena Rage: together different game? 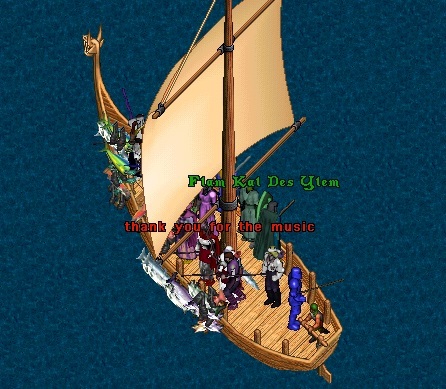 Athena Rage: so its not part of uo? Kyronix : Thanks for your question! 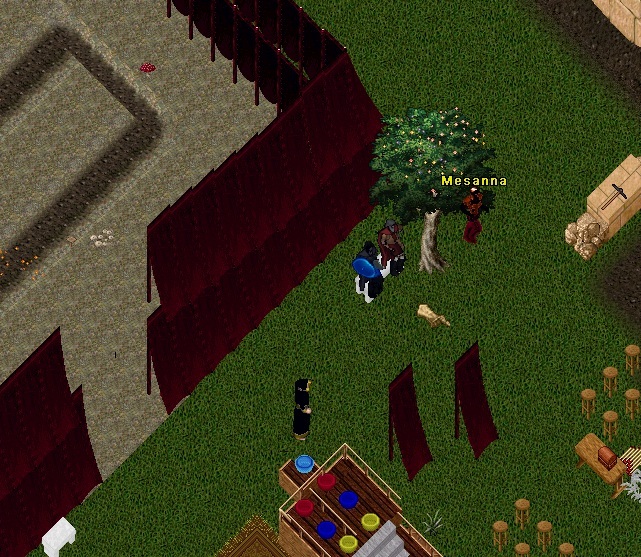 Savoua Fair: Will Factions continue as a lead for PvP in Felluccua? 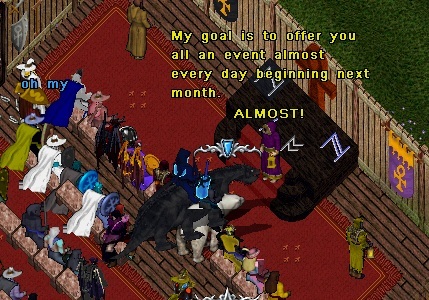 Savoua Fair: So wait to restart in it? Savoua Fair: Ill keep an eye out. Misk: meaning customizable castles or using the existing wall art to decorate casles? Alice Wonderland: wonderful! hopfully very soon! Mesanna: do you have a white rabbit in your pocket? Kyronix : Thank you for the question! Agatha: adjust their suits in advance? Agatha: Some of the mods on faction artifacts can essentially make or break a suit, which is why I asked. Agatha: Ah yes, that was my concern Kyronix. Agatha: Thank you all for your time, have an excellent night! Tika W Majere: I couldn’t stay away! Tika W Majere: You should come visit us more often! Tika W Majere: That is all! Tika W Majere: Thank you! Kyronix : Thanks for having us! Bleak: Thanks for having us! Kyronix : Have a great night everyone! Legends was eager to welcome their new EM who is stepping in after the sudden departure of EM Helios. A large crowed had gathered inside the Event Moderators Hall and suddenly EM Miko appeared with his new side kick EM Mayu. The two EMs look to have many similarities with one glaringly different feature….EM Mayu is a female and the first of her kind on Legends. 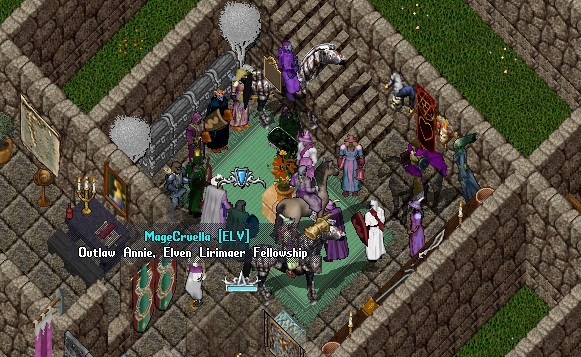 In a playful discussion between the EMs and players the new EM explained several ideas they hope to implement on Legends. 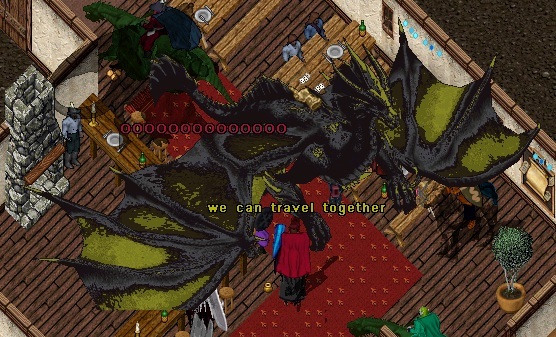 The current story arc involving the sea dragons and dueling cities will continue shortly and the EMs have promised that several new branches of events will spiral off the current story line. Players will have opportunities to contribute during the events and more importantly, they will also have opportunities to contribute on their own time when the events are not active. The EMs also explained that their website, http://legends.uoem.net/, has been revamped and it looks really nice, please visit when you get the chance. It should serve as a good spot to find information on the EMs and their events. The crowed responded pleasantly when EM Mays addressed Miko’s stinginess and promised for a more steady flow of rewards to the players who participate in the events. Welcome EM Mayu!! may your journey through Legends be long and prosperous! Another Halloween has come and gone with plenty of pumpkins picked, skeletons slain and bones collected. 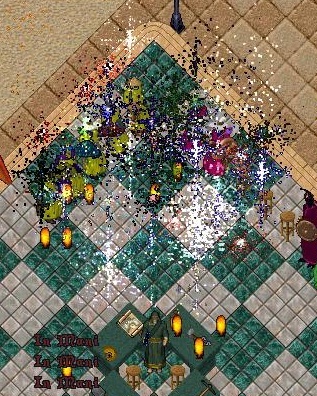 The 2012 edition on Legends featured a long night of events hosted by EM Miko, who showed his true colors when he finally arrived without wearing his trademark hooded shroud. Or maybe it was just a really good costume but it looked real to me. See for yourself…..
After stuffing packies full of pumpkins the crowed was split into two teams and they reassembled at Jhelom Farms. For the first game the two teams would face off against each other as they attempted to fill there pens with the most pumpkins. The teams pillaged and plucked each others pumpkin patches and when the tug of war finally ended the grey teams pile was slightly more polluted with pumkins. The second event also featured you favorite vegetable, yes the pumpkin. The winner of this game had to match EM Miko’s pumpkin sequence quicker then anyone else. It’s not as easy as it looks. This years 2012 Legends Halloween Trick or Treating Champion is…..Wobble!!! Congratulations for out trick or treating everyone on Legends and getting more tricks per treat then even the most experienced of trick or treaters. 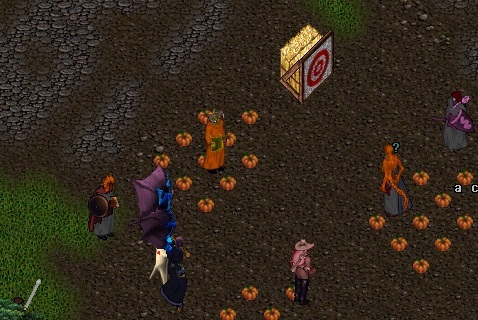 Once the group had pouches full of candy from the last game they headed back to Jhelom Farms to use it in the next game. This game involved eating candy while running across a field, and I know what your thinking….never run and eat candy at the same time! But we did anyway and I think everyone survived. 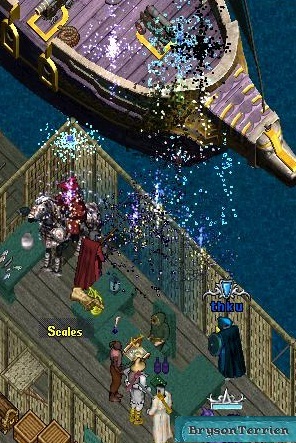 One of the last known Bal Thran scales to the shard was revealed by EM Miko. Knowing it had devastatingly evil powers we decided the best thing to do with it was crumple it up and toss it in the water….So we did. 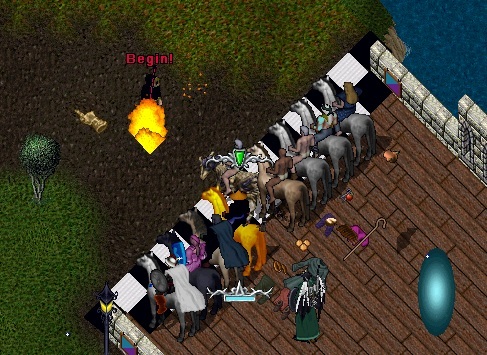 And the results were unfortunate as an army of undead and EM Miko’s Dragon swarmed the Island. EM Miko laughed as most of the players parished but they still showed enough wit to eventually defeate the swarm. Next up was the pumpkin carve. This game also involved running but it was much safer as this time you just had to carry a knife. The knife was used to carve through boars as the players would race to the pumpkins which they were required to carry across the finish line. Everyone was a winner at the apple bobbing game but those who stayed for the after party got a special peak at EM Miko’s arsenal of Dragons. Happy Halloween Legends. In a shocking report from the docks of Serpents Hold the Defenders of Jhelom and players of Legends have come to find that the Mythical Sea Dragons that were contained in the waterways have disappeared. There is no explanation on how they escaped the ship blockade or where they could possibly be. These dragons have been known to have special powers and abilities that could pose danger to the realm if they fall into the wrong hands. Any information on the dragons where abouts should be reported immediately. The Sea Dragons have resurfaced in Serpents Hold and now have a temporary home on the west side of the Island. 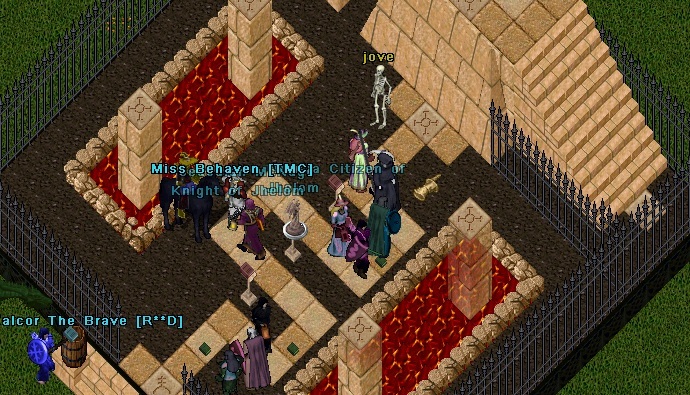 First off Lady Mesanna stopped in to let the players know that EM Helios made his own decision to step down as an EM. Mesanna explained how he had worked with the EM program for 4 years and wanted all the players on Legends to know how much he enjoyed working with them. We should expect to see a new EM arrive at some point on the shard and she hinted towards the possibility of this person being a female, which would be a first for Legends. 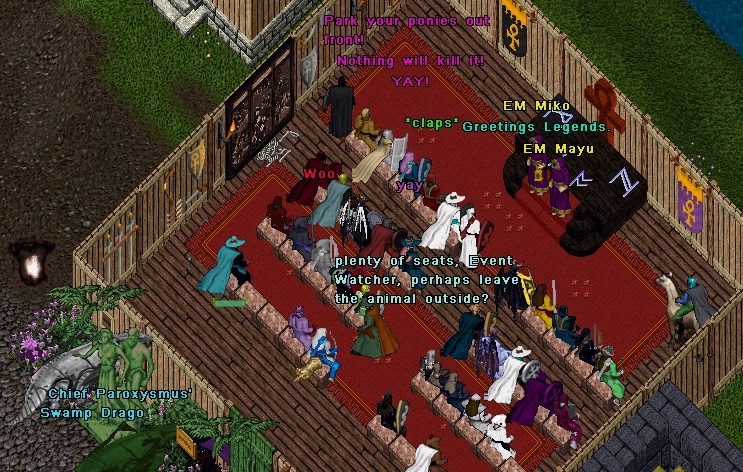 Then EM Miko hosted a meet and greet for the players of Legends. Many things were discussed and for those who missed I would like to fill you in on some of the information that we received. 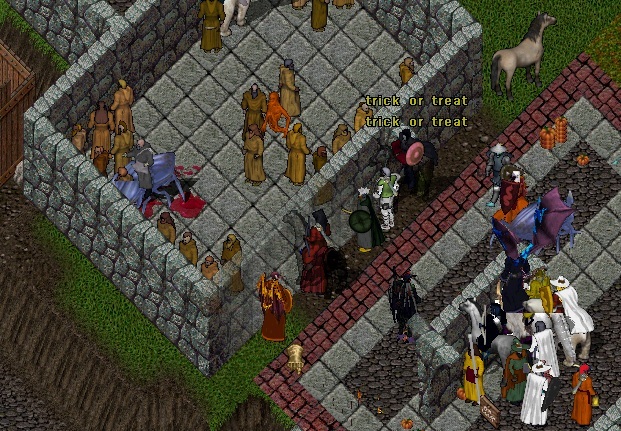 EM Miko was looking for input and feedback on the recent and future events on Legends. Time of the events was a hot topic so we took a vote and 9pm EST was the most popular time. EM Miko was happy with the turn out of players at last month’s events which were all held at 11pm. So he promised to hold events at different times to try to accommodate as many players as possible with the possibility of multiple events per day. The most important thing regarding time of events is to check the town criers, they will have time and dates posted several days before their occurrence. Events for the current story line will be held on Mondays through Thursdays. There will be a points system put in place based on participation with attendance being taken at the beginning of an event. Players will have an opportunity to turn in a book with their name to the EM during an event as well. Points will also be based on other things like progressing an event, making a discovery, helping others progress in the event and by various other contributions towards the event. The point Tally will mainly be used to determine titles much like the “Sea Dragon Herders” that you see on Legends currently(I’m guessing). 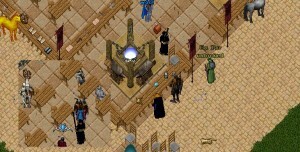 The current event has two groups of players squaring off against each other. 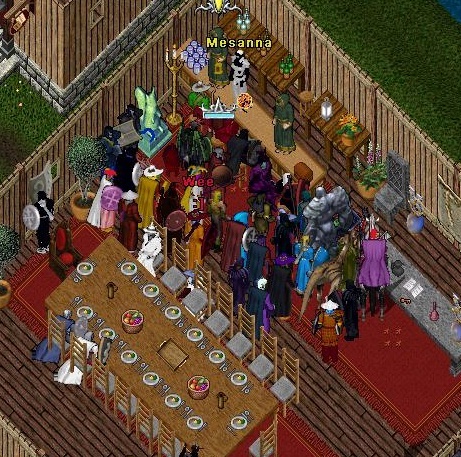 Both groups are centered around a city, Jhelom and Trinsic. Players can choose to have characters on both sides but one single character can only choose one side at a time. And you can switch sides, but all these things may effect your points. 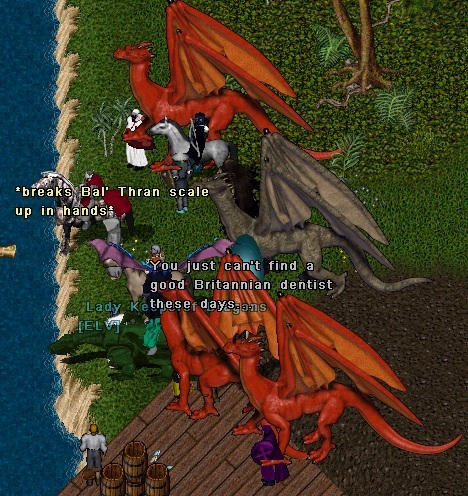 The Defenders of Jhelom are currently working to protect their beloved Mythical Sea Dragons while the Trinsic Elite has threatened war and boasts the powers of several Crimson Dragons that have laid carnage to several players already. 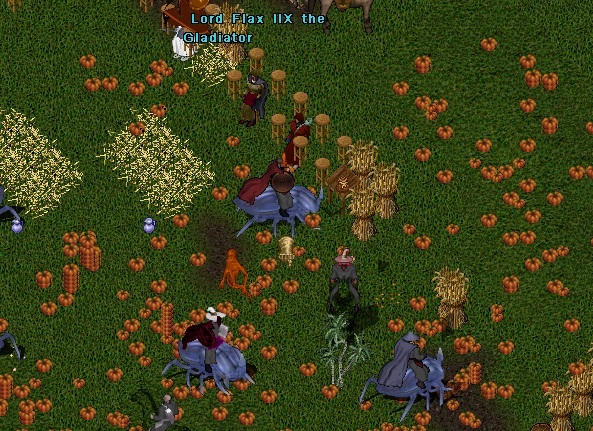 There are also missing purple frogs on Legends right now that may be of use to one or both of the player groups. Events are set to continue next Monday so watch the town criers. It was worth the wait! 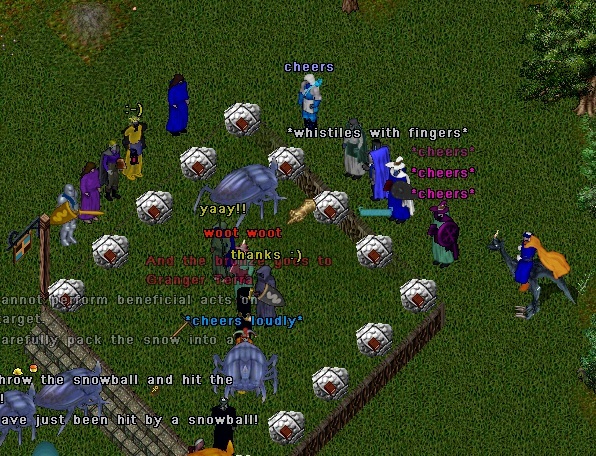 This years Festival was a success from start to finish, packed with creative competitions, rewards, giveaways and the colorful community that makes up Legends. Big thanks to DevilsOwn and her entourage, you put together a memorable weekend. 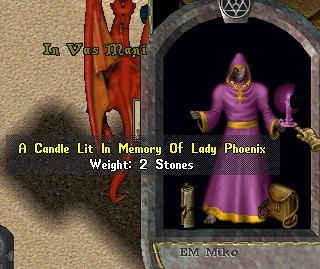 In loving memory of Lady Phoenix. 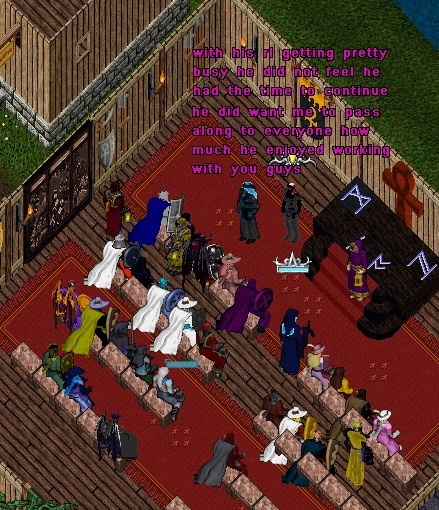 It’s not a festival unless there is Mage Poker. Patiently waiting for the IDOC to drop with some Phoenix to keep everyone company. Thank you TMC. You got thirty minutes to catch the biggest fish of your life. Literally, because the boats going to sink! Throwing darts at a mongbat is fun. Throwing darts at a mongbat while drunk is even more fun. Mystikal took down the reining Olympic champion on his way to winning the Archery Tournament. What? 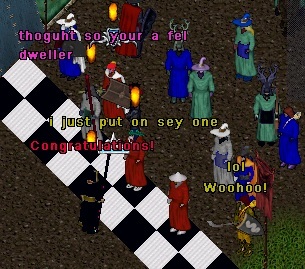 Someone gets a free castle? Ok, where do I sign up? Pedestal Pong…. a game of chance, teleportation, fun, and frustration. 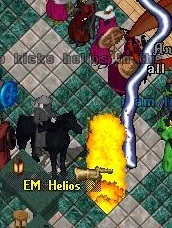 I would like to thank EM Helios and everyone who participated in the events for the 2012 Legends Olympics. Here is a quick wrap up on the medalists for the final day. A handful of medal winners did not declare a facet. 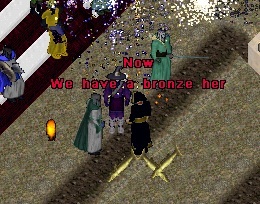 Mage Battles was the first event and Bearded McNuge managed to get burned to a crisp twice salvaging a bronze while Zathora Mand Rak and Jedidiah McNuge battled down to the rubber match for the gold. With a just a few hit points remaining Jed was able to defeat Zathora and set the final spots on the podium. 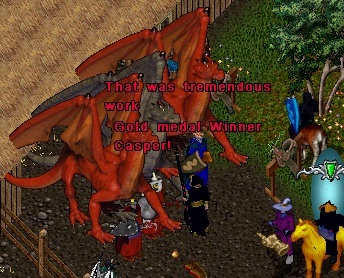 Zathora was proud to add another medal for Ter Mur. 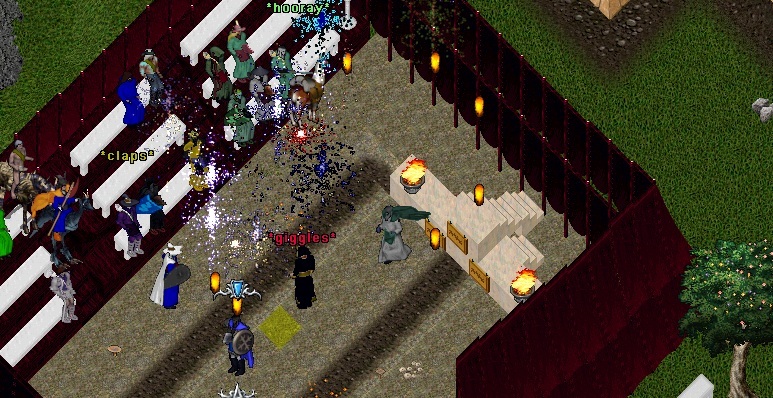 The final event of the night was the King of the Hill set to take place at the Jhelom Pits. In a game of numbers Guild Member did well to hang on and capture a bronze medal. Jedidiah McNuge doubled up on the day in golds as he showed his brother McNuge who ruled on the day. The final day of the events is tomorrow beginning at 6pm EST.